Love it or hate it, Marmite is a traditional British brand. 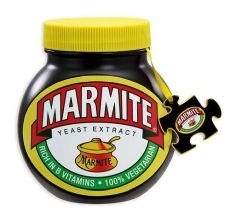 This 500 piece jigsaw is double sided with a Marmite pot on one side and a retro art image on the other. Presented in a super-cool Marmite tin!